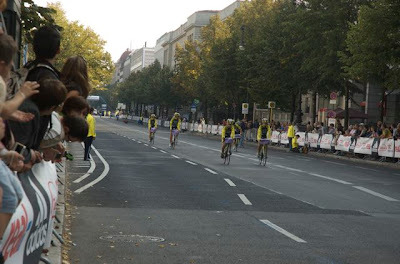 It is just before 9:00 am on Sunday 20 September, the morning of the Berlin marathon, and the race is about to start. The air is crisp with expectations and the scent of loose bowels. 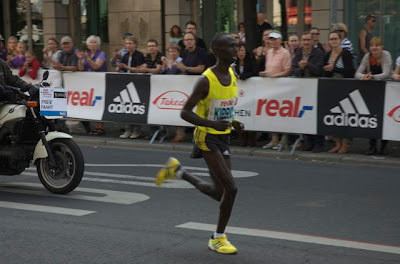 Haile glances at his flourescent adidas racing flats. 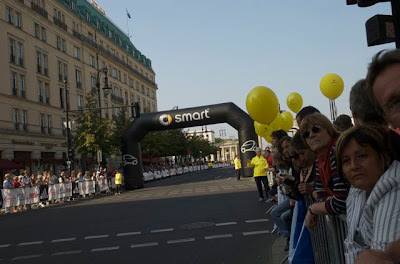 The race organisers run through the usual preparations, and check that Vangelis' Chariots of Fire theme is cued to play. I look at my watch. Painedly. It's almost 9 am, and here I am in bed, looking first at my watch, then at the limbs of my beautiful girlfriend, crumpled beneath white sheets, and here I am nursing a sore head. The hotel coffee is bad. More or less all drinks in Berlin are bad, except for the bier (though the spatburgunder is pleasant enough in context, you probably wouldn't go to an effort to import it). So I put on my jeans and wander off to a nearby strasse where I saw a row of cafes yesterday. As soon as I turn onto it there's a familiar guitar riff, and a band breaks into 'I Shot the Sheriff'. Groovy. I limp along the street, and the memories of passing down the long, straight, vacant strasse that lies ahead of me come rushing back. I used to be an athlete, I remember that now. And then there came the hamstring. Hi-vis marshalls crowd water tables. Haile will be 8k into the race by now. He'll pass by here in a little less than an hour. I find a cafe and buy a large, muddy coffee, a large tea, and a couple of pieces of cake. I limp back to the hotel, wrestle with the door holding drinks. It's the art-otel Berlin, elegantly themed in lime green and full of pictures of Andy Warhol, and the fancy electronic keys don't work. My head begins to clear, and soon I've dragged Nicky from the room so we can watch the end of the race. In the bright and cool sun we stand half a kilometre from the end, close to the Brandenburg gate. Cyclists pass by on the route, soaking up the atmosphere as if anyone cares about cyclists here. Note the shoes. And then came the others, including the pacer. 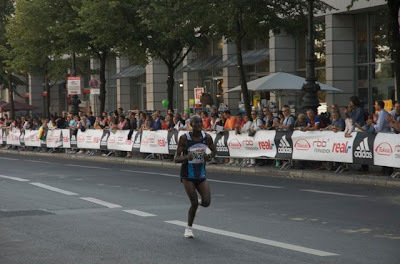 I think his name was Negari Terfa, and he came in half a minute after Kiprop. It struck me as a little unfair that he ran under 2:08, and ran by as anonymously as the fat cyclists. It made me want to offer a little thought for all of the pacers in the world, who lead in the names for an agreed fee, and almost never win. Then others pass, thousands of them. As the mortals run by I'm beginning to feel despondent. I see my own time from two years before pass ... that could be me. We don't stay but wander off to lunch. It's bad Italian food, but the weissbier is just fine. I will be back next year, and, racing flats or not, I will be neither hung over nor slow. It's time to get righteous again. I am shocked that drinks are supposed to be bad in Berlin. I always think you get double the quality for half the money in comparison to England!